Sweet Country is a 2017 Australian western film directed by Warwick Thornton. It is set in 1929 in the outback of the Northern Territory, Australia. It was screened in the main competition section of the 74th Venice International Film Festival and in the Platform section at the 2017 Toronto International Film Festival. At Venice, it won the Special Jury Prize award, and at TIFF it won the Platform Prize. It also won Best Feature Film at the 2017 Asia Pacific Screen Awards. Sam is a middle-aged Aboriginal farmworker in the outback of Australia's Northern Territory soon after the end of the First World War. His employer, Fred Smith, a religious man, agrees to lend Sam to a bitter war veteran named Harry on a neighbouring farm to renovate the latter's cattle yards. Harry is clearly disturbed by his involvement in the war and he rapes Sam's wife after sending Sam out to round up some cattle. Sam's relationship with Harry quickly deteriorates during Sam's stay. Later, Harry visits the farm on which Sam works looking for a runaway Aboriginal youth named Philomac. Harry fires shots which ends with Sam shooting and killing Harry in self-defence. For the murder of a white man, Sam is now on the run from the law with his wife across the outback. The manhunt for Sam is led by Sergeant Fletcher, who has to contend with the heat, venomous animals and hostile natives. Questions of justice start to surface as the true details of the killing come to light during Sam's trial. On review aggregator website Rotten Tomatoes, the film holds an approval rating of 95% based on 81 reviews, with an average rating of 8.3/10. The website's critical consensus reads, "Sweet Country makes brilliant use of the Australian outback as the setting for a hard-hitting story that satisfies as a character study as well as a sociopolitical statement." On Metacritic, the film has a weighted average score of 87 out of 100, based on 13 critics, indicating "universal acclaim". ^ "Made in SA Showcase". SAFC. Retrieved 13 March 2019. ^ Lodge, Guy (7 September 2017). "Venice Film Review: 'Sweet Country'". Variety. Penske Business Media. Retrieved 7 September 2017. ^ Anderson, Ariston (9 September 2017). "Venice: Guillermo del Toro Wins Golden Lion for 'The Shape of Water'". The Hollywood Reporter. Retrieved 9 September 2017. ^ Vlessing, Etan (17 September 2017). "Toronto: 'Three Billboards Outside Ebbing, Missouri' Captures Audience Award"". The Hollywood Reporter. Prometheus Global Media. Retrieved 6 April 2018. ^ "Australia's Sweet Country Wins Best Feature Film At 11th Asia Pacific Screen Awards". Asia Pacific Screen Awards. 24 November 2017. Retrieved 23 February 2018. ^ "Sweet Country (2018)". Rotten Tomatoes. Fandango Media. Retrieved 28 August 2018. 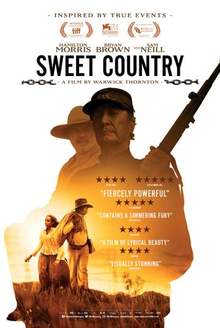 ^ "Sweet Country Reviews". Metacritic. CBS Interactive. Retrieved 4 April 2018. This page was last edited on 13 March 2019, at 08:47 (UTC).